“Six billion dollars, Mr. Day,” her words took eerie flight throughout the empty gallery. slow rotation of a light filled the gallery and the inlet shoreline of Lake Superior. in a black turtleneck cape, wanted my full attention. that you come with the highest of recommendations: the recovery of Don Reynosa’s ‘A Rapt St.
She stepped back into the darkness. home from the tony end of the lake front, and in the winter wind, could only quicken analysis. starlit horizon. A single, golden light from the solitary church window bid refuge and more. 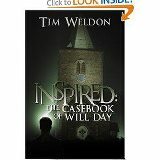 Inspired: The Case Book of Will Day by Tim Welton is available at Amazon.com. Tim Weldon is Professor of Philosophy at the University of St. Francis in Joliet, IL. His latest book is "Faring Homewards: The Philosophy of Antoine St. Exupery" (E-booktime).